http://www.vintagestylemannequins.co.uk/. She is in the Retro Collection. 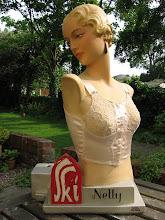 A lovely customer sent me this photograph recently of her new waspwaist mannequin settling into her new home. Karen sent me the fabric to use for the tailoring - a very beautiful and heavily embroidered fabric. I love the opportunity to use new fabrics in this way and was very pleased with how she turned out. Thankyou Karen for sending me the photo and I think she looks very elegant in her new setting. I can use most fabrics to tailor with, so do get in touch if you have a fabric you would like me to use. 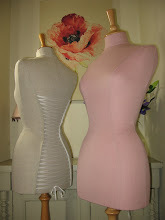 In a determined effort to use some of my collection of fabrics, new mannequins will be coming soon! I keep buying beautiful fabrics, knowing they will make beautiful mannequins and then not having the time to make them up. I am working on one at the moment which will be ready at the weekend.